Miles Airport is situated approximately 45 k’s from the town of Chinchilla on the Leichhardt Highway. 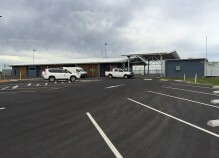 A major expansion of the aerodrome began in 2013 to meet the needs of the coal seam gas industry, culminating in the construction of a new terminal which was completed in February of 2016, the result of a $30 million investment by Origin. The aerodrome caters for circa 2500 pax per month and accepts various aircraft types, including Fokker 28 – 70, Bae 146-200, de Havilland Q200/300/400, SAAB 340TW, ATR72-500/60 series A/C, Embraer 135 & BJ600 series A/C, airline operators include QantasLink, Virgin Regional, REX, Corporate Air & Skytrans, with Ground Handling provided by Arrow Airport Services & Aviation Ground Handling. Chinchilla Aerodrome, has also benefitted from a considerable $5 million dollar investment. CASA certification was obtained in August of 2015 and the aerodrome caters for FIFO, General Aviation & Agricultural ops. Passenger movements currently sit at circa 1800 per month. AMS commenced management of the aerodromes on the 1st of October, and we look forward to working with the Western Downs Regional Council for the duration of the contract.